Ours is a Software research and development centre located in Kerala concentrating in the field of Indian language computing since 1990. our Mission is to give access to the breath-taking developments of information technology in Indian languages to the common people of India, through computer, Internet and Mobile phone. 1993 October 5: Released "Thoolika", Malayalam DTP software under MS Windows 3.1. The first Malayalam DTP software from Kerala. 2000 February :Released Vedic Astrology software PROPHET. 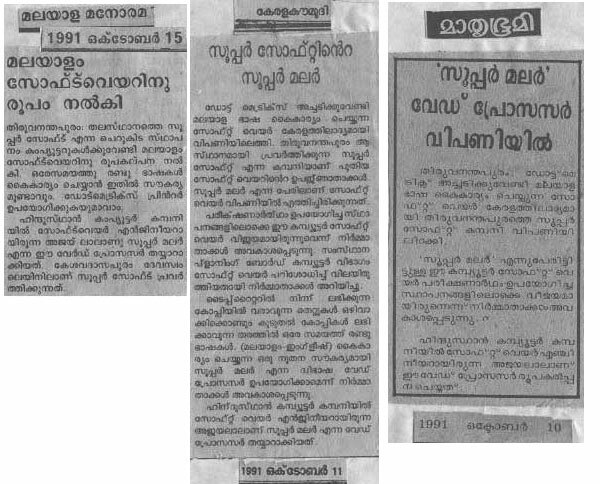 2001 July 13: Released Kirali SDK, Malayalam Software Development Kit. 2001 December 11: Released Aksharam - Bilingual (English/Malayalam) word processor for Windows95/98/ME/NT/2000/XP. 2002 June 16, Reformed Malayalam Unicode font for reformed Malayalam script. The first Unicode font for Malayalam language. 2002 August: 21, Released "Thoolika2002" with Inscript and Remington keyboard driver for inputting Malayalam Unicode text in Office XP under MS Windows95/98/ME/NT/2000. 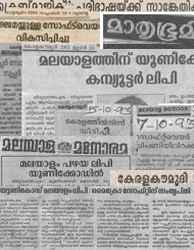 2002 October 28, Released a Traditional Malayalam font in Open Type Unicode format, The first Unicode font for Traditional Malayalam script. 2005 September 15 : Released "ScribeMagic", Unicode based Translation/Transliteration software for Indian languages. 2006 March : Released PROPHET2006 Indian Vedic astrology software in Hindi, Malayalam, Kannada, Tamil, Telugu and English. 2006 April : Released ThoolikaUnicode . For inputting Unicode format Malayalam in OfficeXP. Remington and Inscript keyboard layouts. 2008 April 14: Released Prophet2008 Astrology software based on Microsoft dotNet technologies . 2009 October 11: Released astrology software for MS Windows based Mobile phones. 2010 November 15: Released astrology software under JAVA enabled mobile phones. 2012 January 06: Released astrology software for Android Mobile phones and Tabs. 2015 December 15: Released Remington(Typewriter) Malayalam Keyboard layout for Android Mobile phones and Tabs. 2016 March 25: Released InScript Malayalam layout Keyboard for Android Mobile phones and Tabs.